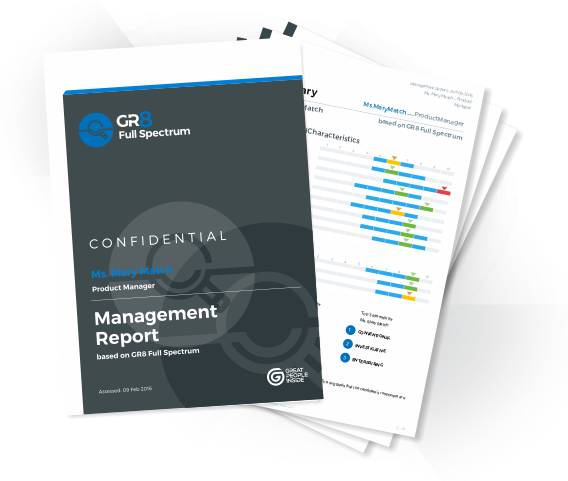 The ultimate tool for measuring employee performance, GR8 Full Spectrum assesses everything from behavioural characteristics to cognitive ability and occupational interests. With this instrument, you’ll be able to get a full overview of an employee’s potential, along with his or her match on a per-organisation and per-position level. The assessment also offers suggestions for future development, as well as the opportunity to create your own content. GR8 Full Spectrum supports organisations in identifying and developing talent and in career management programmes.